The stock market has often been an early indicator as to the health of a company, industry, or even the general economy. When you see companies stock prices rise, especially when they rise quickly, it’s generally a symbol of stability and optimistic growth for that company on the part of the investors. So even if the good fortunes are not realized immediately, they look to be headed in a positive direction. That is certainly the case for the two key optical disc media manufacturers in Taiwan. Both of them had record setting growth in terms of their increased stock valuation in May. The increase is due to multiple opportunities for increased optical disc sales and profits currently and in the future, such as long term archival of cold storage, security, evidence, entertainment, and more. So why would I be talking about the good fortunes of others? As the saying goes, high tide lifts all boats. When the industry as a whole is seeing growth, all those serious suppliers involved in the optical disc market will also experience growth. Optodisc has also benefited from this new market trend through greater opportunities from new and existing ventures. Our focus on providing high quality selective media at competitive pricing has shown dividend from those tired of receiving media with inconsistencies and high failure rates. Plus, with Vinpower’s vast expertise in duplication hardware and Optical Disc Drives (ODD), it puts us in a class of our own. 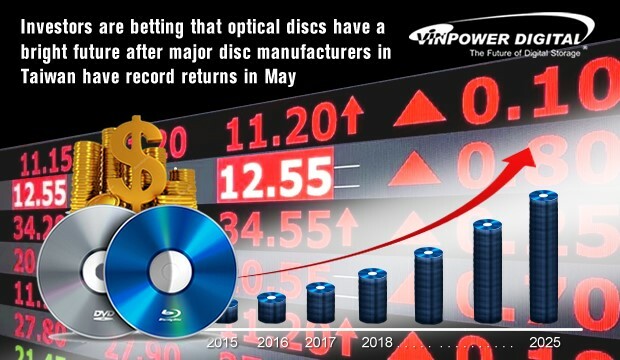 So we celebrate the accomplishment of others in our industry because we too are reaping the benefits from the shift in outlook on the optical disc market.